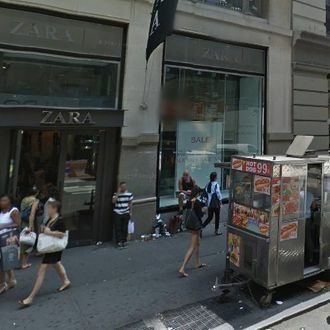 A woman was hospitalized on Friday afternoon after a piece of plywood hit her in the head as she walked through Soho. Witnesses told CBS New York that the two-by-four appeared to have fallen off the seventh floor of 580 Broadway. (“The building does have work permits posted on the door,” CBS noted. “But the Department of Buildings said it was not called out to the scene. That could indicate the piece of wood that fell did not come from an authorized construction project.”) The woman — whose head was “gushing blood,” according to ANIMAL NewYork — was taken to Bellevue, but the extent of her injuries is unknown. Back in March, a 37-year-old woman was killed by plywood that had blown off a Greenwich Village construction site. Falling plywood: just another thing New Yorkers can worry about but not control.